May is National Bike Month! I know my girls and I love the endless fun and the health benefits like better cardiovascular health and reduced obesity risk that our bikes provide. 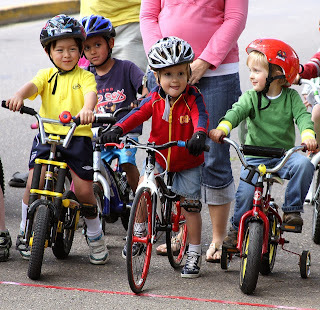 Will your family join us by celebrating biking in nine fun ways? Is there a local trail you want to explore, or have you heard about a fun tourist sight in a nearby town? Plan a day trip and ride there on your bikes. Remember to pack a picnic, plenty of water and your cameras as you enjoy family fun and exercise. Do you have outgrown bikes collecting dust in your garage? We like to clean them up and share them with neighbors or friends. You could also donate your wheels to a local thrift store or homeless or abuse shelter where other people can use and love your family's outgrown bikes. Turn your driveway into a fun and safe bike obstacle course with common items. A maze of traffic cones, small sticks, kitchen stools, flower containers, and figure eights drawn with chalk test your bike riding agility and give your family hours of fun together. My girls collect beads, ribbon, and other craft supplies that we're going to use to create streamers for our bicycle handlebars. What random supplies do you have lying around your home? Spend an afternoon creating customized streamers that decorate your bikes in style. The Consumer Product Safety Commission recommends that you replace your bike helmet every five years. Have you done that? Take time this month to buy new helmets for you and your growing kids. Do you always ride on pavement? Test your bike skills on rocks, grass, or cobblestones. You might just find your new favorite riding spot. Nothing says "celebrate" like color! Grab spray paint, masking tape, and newspaper, and give your bikes a makeover. Whether you create a rainbow design on your bike or cover your son's boring black bike in bright orange, paint goes a long way toward adding fun to your next bike ride. Want to build a basket out of paint sticks or crochet a seat cover? Maybe you need a new bike rack in your garage or back yard. Use your imagination as you create works of art and trick out your bike with everything from paint color sample cards to wooden pallets. Do these ideas inspire you to dust off your bikes and take a ride? I know my family can't wait to have fun on two wheels. Maybe we'll see you on the trail!